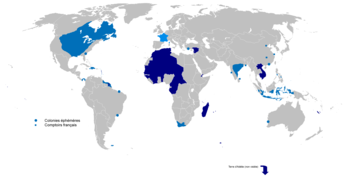 The French colonial empire constitutit the owerseas colonies, pertectorates an mandate territories that came unner French rule frae the 16t century onwart. ↑ Rein Taagepera (September 1997). "Expansion and Contraction Patterns of Large Polities: Context for Russia". International Studies Quarterly. 41 (3): 501. doi:10.1111/0020-8833.00053. Retrieved 16 September 2016. ↑ Rein Taagepera (September 1997). "Expansion and Contraction Patterns of Large Polities: Context for Russia". International Studies Quarterly. 41 (3): 502. doi:10.1111/0020-8833.00053. Retrieved 16 September 2016. This page wis last eeditit on 22 Apryle 2017, at 18:21.